Parents lie to children. Most lies aren’t told with malicious intent. Most of them are told for convenience. It’s often easier in the moment to tell a child some white lie which will appease them rather than telling an aspect of the truth which might lead to more questions. “Where do babies come from?” Johnny asks. Not wanting to answer the potential follow-up questions, Johnny’s mom simply says, “You get one at the hospital.” This answer might appease a three-year-old, but it’s a lie. While lies can make our lives easier in the moment, they always make them more complicated in the long run. Every family needs to apply the following family rule: we always tell the truth. We might not tell every detail. We don’t over share. We always tell the truth in the context of individual maturity. But we do not lie to one another. By consistently telling the truth, we train our children that we are reliable sources of information. They grow to learn they can always come to us for the facts. Unfortunately, many parents continue to lie. They do so without understanding the long-term toll it takes on their parenting. As children begin to understand their parents are not telling them the truth, the kids turn to other sources for information. The parents might not even realize this is happening or might think it’s a natural part of family dynamics. As one generation lies to another that generation will likely lie to the next. Some families have no understanding of what it would look like to tell the truth within their family. But the truth is always better. 1. It won’t hurt. It’s okay to say this if you are absolutely certain it won’t. However, if it might hurt, it is far better to let your child know. If a baseball hits you, it will hurt. A shot will hurt. Doing hard things can hurt. Our children do not need physical pain minimized, they need to learn how to endure some pain in order to get the outcome they want. Rather than denying the possibility of pain, parents should explain the likely possibilities. 2. You have nothing to worry about. Do you ever remember a time of no worries? Life is full of stress. It’s true for four-year-olds just as much as forty-year-olds. While the stress of a child might seem like nothing to an adult, it feels like a lot to a child. In the same way we shouldn’t minimize our child’s physical pain, we shouldn’t minimize their emotional pain either. Rather than telling our children they have nothing to worry about, we need to explore with them what their concerns are. 4. If you don’t obey, we are canceling vacation. Will you really “turn this car around?” Are you actually willing to cancel the Disney vacation? If so, then make all the threats you want. If not, then stop lying to your kids. Parents love to threaten. It’s a way to manipulate our child to get our way. Yet whenever we threaten something we aren’t willing to do, our kids will eventually understand the game. Then they will know our words are empty. 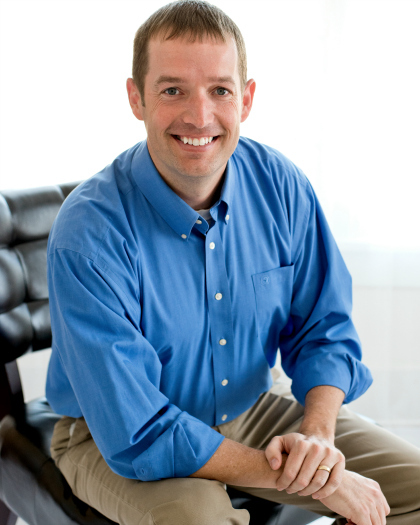 Laying out clear consequences for the bad choices our children make is great parenting. We should do so often. Over-exaggerating consequences which we aren’t willing to follow through on is horrible parenting which we must stop. In some instances, telling the truth is hard work. It takes discernment, time, and will likely lead to more conversations. However, teaching our kids to value the truth and modeling for them that we are always a source of truth is well worth the effort. Stop lying to your kids and watch how your relationship with them changes. 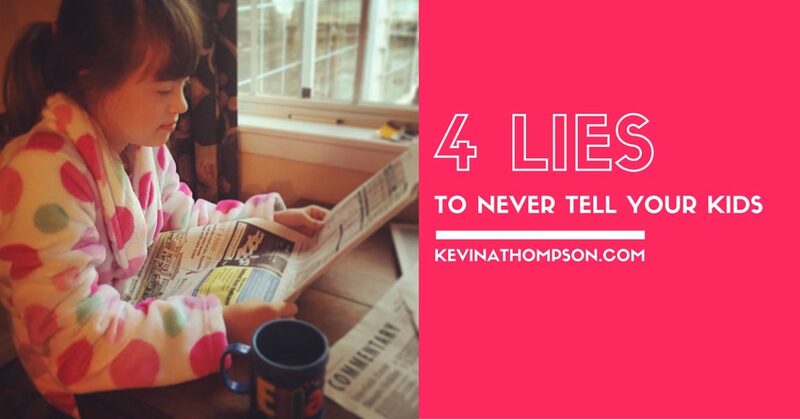 What is a 5th lie we should never tell our kids? …After all, if you tell your kids Santa is real, and the Easter Bunny is real, and Jesus is real. When they grow up and find the truth, will they also think you made up Jesus too? I agree with these. And I’d love to hear Mr. Thompsons thoughts on the Santa/Easter bunny dilemma. The world seems to be coming up with more and more myths–now the leprechauns visit and the Elf on the Shelf. I worry a lot about the stories because I, like Tami, want my kids to believe in God and Jesus Christ. Great advise. The world will be painful for children whether we like it or not. We should teach them to be resilient and that pain can be worth is for the outcome as you say. We found a way that is close to number 4 but without a lie implied: While going on a trip or to vacation we can’t concentrate (and don’t like it at all) with our kids whining in the car or even quarrel with each other (there are four of them). So, we always tell them: if you don’t stop right away, we drive on the side of the road, and wait until you can behave/stop whining. That always works… However, sometimes after driving on the side to wait (mostly only a few seconds) that they stopped. We always treated lying to the kids the same as lying to anyone else. A lie is a lie and isn’t tolerated in our family.